The percentage of uninsured people is steadily dropping to its lowest level in recent history and experts suggest that the president’s health care law is likely behind the decline. 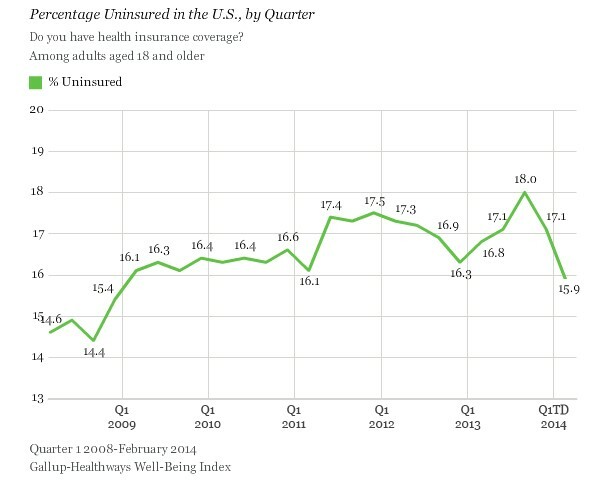 The uninsured rate stands at 15.9 percent this month—the lowest point in the last five years, the latest Gallup poll shows. It has steadily decreased from a high of 18 percent in the third quarter of 2013 to 16 percent in January. This is the first time in the last five years that the uninsured rate has reached the 16 percent range since 2009 when it dropped to a low of 14.4 percent. The insured rate is closely tied with the unemployment rate—so when unemployment peaked at 10 percent in the wake of the financial crisis in 2010, the uninsured rate also climbed. As the economy slowly began recovering it held steady, but shot up to its highest point in the third quarter of 2013, just as the health exchanges were about to launch. At the time, Gallup predicted that the rate of uninsured people would fall in 2014 as more Americans became aware of the requirement to have insurance. Last month, when the uninsured rate first hit a five-year-low, Gallup pollsters cautioned that it was too early to credit Obamacare—but as the rate continues falling they are beginning to acknowledge the impact of the potential impact of the new law. “This drop could be a result of the ACA, which aims to provide healthcare coverage to more Americans through multiple provisions, including federal and state healthcare marketplaces where Americans can purchase health insurance coverage at competitive rates,” Gallup said in an analysis. Some experts, however, say it's still too early to be thanking Obamacare for the decline. Larry Levitt at the Kaiser Family Foundation previously noted in the Washington Post that the margin of error in Gallup's poll is plus or minus 1 percent among all adults. "It’s very likely that the change in employer coverage from the end of 2013 to the beginning of 2014 is within the margin of error." Levitt added that "Gallup has shown a decline in employer coverage over time, driven by changes in the economy, not the Affordable Care Act." The survey comes five months into Obamacare’s rollout and just weeks before the deadline to sign up for health coverage this year. So far, the White House estimates that about 4 million people have enrolled through the exchanges and about 9 million people have been deemed eligible for Medicaid under the new law. Though the administration has not provided figures detailing how many of those were previously uninsured. A separate study by the McKinsey consulting firm found that just 27 percent of total enrollees did not have health insurance. The study suggested that the law was not fulfilling its key goal of expanding access to people without health insurance. That survey, however, did not include people who have gained coverage through the law’s Medicaid expansion. The Gallup survey, which does include Medicaid enrollees, noted an uptick in the percentage of people getting health coverage through Medicaid as well as individually purchased plans. The uninsured rate dropped fastest among low-income people earning less than $36,000 as well as Black individuals. Gallup also found that the percentage of people getting coverage through their employer decreased. This could be explained by a handful of factors including employers like Trader Joes and Home Depot, which have dropped insurance policies for part-time workers or employees finding better deals on the new insurance exchanges. Meanwhile, the survey also found that the uninsured rate among young people—the group most crucial to Obamacare’s success-- has fallen the slowest—and only declined a half a percentage point since December. The White House has routinely stressed that it must enroll a strong mix of healthy, young people to offset the costs of older, sicker Americans who tend to rack up higher medical bills. Officials originally estimated they would need this group to make up about 40 percent of total enrollees---however through January, they accounted for just 27 percent. Still, officials say they are expecting a crush of enrollments ahead of the March 31 deadline.